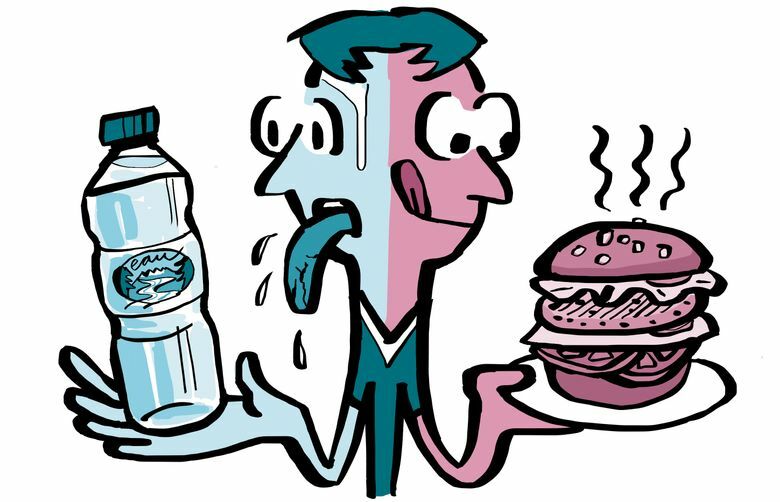 Hunger vs. thirst: Are you eating when you should be drinking? Telling the difference between hunger and thirst sounds easy, but, in reality, people confuse the two all the time. Can you tell the difference between hunger and thirst? While it seems like the answer should be a resounding “Yes,” the reality is often quite different. Our internal “I’m hungry” and “I’m thirsty” cues can be subtler than you think, especially when we’re only mildly hungry or thirsty — or when we’ve developed the habit of ignoring our body’s cues altogether. Muddying the waters, so to speak, is that some symptoms of mild dehydration — headache, fatigue, lightheadedness and difficulty concentrating — can resemble symptoms of hunger. Many people experience the “classic” hunger cues of a growling or empty-feeling stomach. For others, the clues that they need to eat are more subtle — again, especially if they’ve repeatedly dismissed or denied their hunger pangs. And while severe dehydration isn’t likely to afflict you on a normal day, you become mildly dehydrated when your body’s normal fluid levels drop by just 1 to 2 percent. Another reason for confusion about whether we’re hungry or thirsty is that much of the time, we don’t wait to actually feel hunger or thirst before eating or drinking. Instead, we eat and drink because we’re bored, because we like the taste, because everyone else is, or because we think we might get hungry or thirsty soon. The near-constant availability of foods and beverages and multiple social situations that encourage eating and drinking make disregarding — and eventually confusing — hunger and thirst easy to do. • They didn’t eat and drink when they were hungry and thirsty. • They ate and/or drank when they weren’t hungry or thirsty. • They drank when they were hungry but not thirsty. • They ate when they were thirsty but not hungry. Another study last year found that, among adults, poor hydration was associated with higher body mass index (BMI). Researchers speculated that individuals who are classified as obese on the BMI charts may have a harder time staying hydrated — the more you weigh the more water you need — and so may be more likely to eat when they are actually thirsty, especially if they find it difficult to tell the difference between hunger and thirst cues. • Stay hydrated. Let thirst be your guide, or you can use the general recommendation to drink eight, 8-ounce glasses of water a day, more if it’s hot outside or you are exercising. If you are drinking enough water, your urine should be very pale yellow. (It’s darker when you’re dehydrated.) Once you’ve eliminated mild dehydration as a cause of whatever sensations you’re feeling, it’s easier to identify hunger. • Start paying attention to how hunger feels for you. Physical hunger grows gradually as the time since your last meal increases. How soon you’ll start feeling hunger depends in part on the size and composition of your previous meal or snack, but pay particular attention to possible hunger cues between two and five hours after eating.